The first month of the year might be low season and include Blue Monday, but January still makes a good month to visit Malaga. Read on to discover our pick of activities, experiences and events that, when brought together, will give you plenty of inspiration for things to do in Malaga in January. One of the loveliest events in Malaga throughout the year, the Three Kings Parade in the afternoon/early evening of 5 January is a must-see. Thousands of children and their parents crowd the streets to watch the cavalcade go by as a rain of sweets falls. A great foodie destination at any time of year, Malaga has some delicious winter warmers that you might want to taste in January. 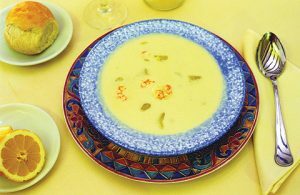 The creamy gazpachuelo is one of them. Not to be confused with the very chilly and bright red tomato gazpacho, this traditional dish comes piping hot and contains fish, seafood and potatoes. Try it at any traditional restaurant in town during January. 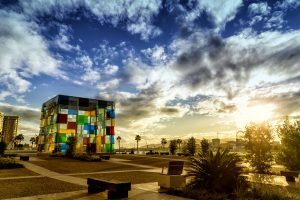 If one of your New Year’s resolutions is to take more exercise, there are plenty of things to do in Malaga in January that will help you keep it. We recommend a bike ride along the western or eastern seafronts. Why? You can soak up the warm sunshine, take in some stunning sea views and then treat yourself to a lunch of fish along the way. Make that fish grilled to keep those calories in check. Or cycle really fast back at the end! January in Malaga celebrates the annual Theatre Festival, a month of plays and performances at the Cervantes and Echegaray Theatres. Most of them are in Spanish, but a few appeal to any language. See our round-up of what’s on in January for some inspiration. Unless you love cold water you won’t be swimming in the sea in Malaga in January. It’s far too chilly. 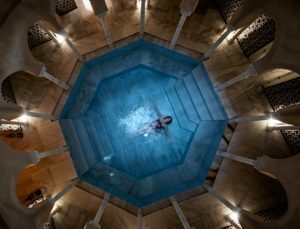 But the good news is that you can still take a warm dip at the Hammam Spa Malaga. Even better news is that it has 2 pools with temperatures ranging from a very pleasant warm to very hot. Plus there’s a steam room and some hot marble slabs to lie on. Bliss! A spot of retail therapy could be on your list of things to do in Malaga in January. All the stores start their after-Christmas sales bonanza on 7 January with plenty of bargains. For a guide to where to go shopping in Malaga, click below. Mostly flat and very compact, Malaga makes a great city for walking. And here’s another excuse to keep that New Year’s resolution. Our website has several ideas for walking tours and for January, we recommend the street art tour. Don’t forget to look up as well as down as you stroll round Soho. January has the clearest skies of the year and possibly the purest light. This makes for amazing sunsets, perhaps the best. View yours from the Gibralfaro Viewing Platform or Muelle Uno. The sunrises are pretty spectacular too – head for the western seafront for the best vistas of the day breaking over the Mediterranean. You might be surprised to find heading for slopes on our list of things to do in Malaga in January. But the 50k+ of ski runs in Sierra Nevada are really just 2 hours’ drive away. Easy to do in a day trip. But check the weather first because it’s a long way to drive to find the ski resort closed because of high winds. January does have the occasional rain, but also a lot of sunshine. Expect between 15 and 20 degrees, perfect for soaking up the warm rays as you enjoy a coffee, lunch or afternoon tea. You’ll be in shirtsleeves while the locals will be in their coats, scarves and gloves (otherwise, when would they wear them?! ).